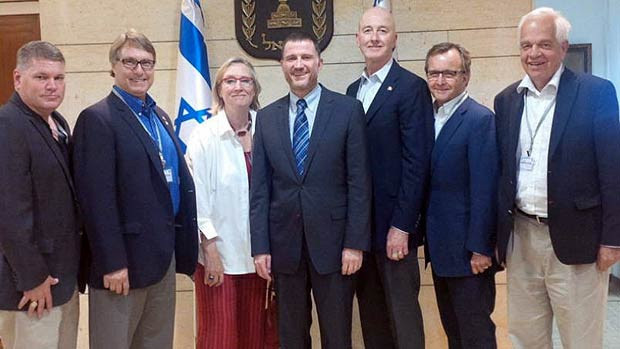 Three Liberals (2 MP’s and a senator) are part of a 6 person delegation in Israel on a two day “fact finding mission” organized by the Centre for Israel and Jewish Affairs (CIJA) according to the Toronto Sun. CIJA says the trip is designed to give the half-dozen parliamentarians “firsthand knowledge and perspective” on the conflict between Israel and Hamas. Except that they aren’t going to Gaza. They are learning about the situation in Gaza by visiting Israel, talking to Israeli politicians, sympathizing with wounded Israeli soldiers and even attending a Solidarity Night with Israel in Jerusalem. I would encourage people to ask a few questions of these MP’s. For example:. Does it make sense to do a fact-finding mission on any conflict by visiting only one side? Do you see any contradiction between a “fact-finding” tour, and a “solidarity tour”? Who paid for your trip to Israel? What did you learn about the Israeli objectives in this conflict? From whom? What did you learn about the Palestinian objectives (or why they are continuing to struggle)? From whom? How much of Israel’s infrastructure would you estimate has been damaged? You visited injured Israeli soldiers and offering your sympathy and condolences. Did you make any effort to visit injured Palestinian women, children or other civilians or offer them any sympathy? After your fact-finding mission, what do you conclude about Israel’s killing of over 1000 Palestinians, mostly civilians, in Gaza? If you do so, I would like to know if you get an answer. Carolyn Bennett is my MP and I am going to write to her. The one-sided perspective of our leading political parties totally boggles my mind. I hope the open letter to political party leaders makes a difference but what bothers me the most is the craven double-think coming not only from politicians but also from ordinary citizens. Israel has a right to protect itself; Palestine does not. Palestinians are terrorists; Israel murders moe than 200 children but they are not terrorists. Palestinians dig tunnels; Israel occupied their land and built barricades and blockades around them but the tunnels, rockets and bombs are all Hamas;s fault. . Israel is committing war crimes opposed by the UN; no discussion will occur in Canada about the human rights of Palestinian people. Palestinians use children as human shields; Israelis bomb schools, shelters and beaches, and the children have nowhere to hide. So my question is, the information is available, it’s all over the internet, what do we do to stop the U.S. and Israel from creating more terrorists so they can drop more bombs so they can develop new arms so they can sell them to Canada? First of all, housekeeping. You spelled Israel wrong in your blog post above in the domain name. Since this was forwarded to me via email, I clicked on it and got the wrong domain name. I thought the domain name was Palestine Is Real and wasted a lot of time. Also, since it is shared as an email, please provide an email address rather than ask us to comment in the blog. It’s so much faster, than logging into my WordPress account first in order to comment. Secondly, I did email the three suggestions above, and I got this. On behalf of Senator Grant Mitchell, thank you for your email. Senator Mitchell has returned from his trip and appreciates being made aware of your views. He is wondering if he can speak with you on the telephone to discuss your comments further? If yes, can you send me your telephone number? I hope I get a message from Senator Mitchell as well! I would be happy to speak to him, or to anyone who want on that mission. I hope you get some news from him about what happened there, if you do talk to him. According to the news, there isn’t very much opposition in Israel to the bombing of Gaza. But there is some, and hopefully they heard from critics as well. Several people have contacted me to say that Senator Mitchell has received their letter and questions and has offered to speak personally on the telephone. I think this is terrific. We can be frustrated that he went on a one-sided trip, but I think that does not make him a dishonest person. I encourage people to talk to him on the phone, be polite and try to find out what he thinks about the situation. Unless you really know a lot about the situation, you are better positioned to express your concern than to try to argue with him. My view, in any case. apologies to Anita and anybody else who was mislead by my typo. please forgive. I emailed them to say I would be happy to talk to him. Haven’t heard back. It could also have been something they were doing to make sure it wasn’t some kind of robot that had messaged them. High Court rules that ‘human shield’ and ‘early warning’ procedures used by IDF to apprehend terrorists are illegal; Mofaz intends to use democratic means to review the issue. According to defense officials, the Israel Defense Forces made use of the ‘human shield’ procedure on 1,200 occasions over the last five years.